MISSION, KS--(Marketwired - Oct 10, 2013) - (Family Features) Halloween is the sweetest holiday of the year, making it a favorite for giddy children who dream of giant bags of candy. Before they rush out the door on Halloween night, make sure your kids and their fellow trick-or-treaters are filled up with something other than candy. 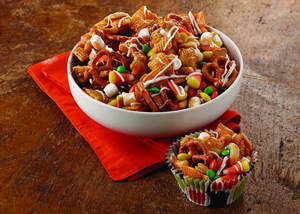 Serve your ghouls and goblins a sweet, salty and colorful snack with this recipe for Spooky Snack Mix. Made with peanuts, pretzels, marshmallows and chocolate chips, it's a perfect after-school snack. For more seasonal recipes and baking tips, visit www.Karosyrup.com and www.Breadworld.com. For a tried-and-true kid favorite, serve them this recipe for classic Pepperoni Pizza. It's the perfect dinnertime solution for busy families who crave the gooey, cheesy goodness of homemade pizza. 2 cups small candies such as candy corn, candy coated chocolate pieces, etc. Mix together cereal, crackers, peanuts and pretzels in large bowl sprayed with cooking spray. Combine sugar, corn syrup and butter in saucepan over medium-high heat. Stirring frequently, bring to boil and cook for 1 minute. Remove from heat and add vanilla and food colorings (mixture will bubble). Drizzle glaze over snack mix and toss to coat. Gently stir in marshmallows and candy; immediately spread on baking sheet sprayed with cooking spray. Melt chocolate chips and oil until smooth. Drizzle over snack mix and refrigerate for 30 minutes to set chocolate. Store mix in air-tight container. Combine 1 cup flour, undissolved yeast, sugar and salt in large bowl. Add very warm water and oil; mix until well blended, about 1 minute. Pat dough with floured hands to fill greased pizza pan or baking sheet. Or, roll dough on floured counter to 12-inch circle; place in greased pizza pan or baking sheet. Form rim by pinching edge of dough.